Analog delay with extra features. That gradual degradation of sound quality that occurs with each subsequent repeat is a charming sound that is ingrained deeply into vintage rock, and the Two Timer is a faithful recreation of that sound. 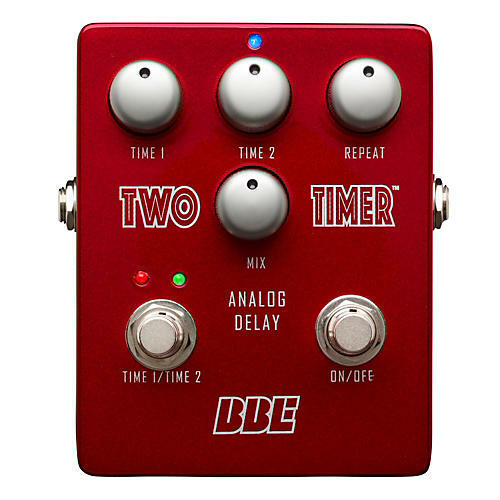 Two Timer delivers the consistency and ruggedness that are the hallmark of BBE pedals, designed for guitarists whose gigs are as demanding as their ears. It features a beefy mil-spec circuit board with big, fat signal traces, 1% metal-film resistors and high-voltage poly caps, all backed up by a robust, true hardwire bypass. When you want the finest vintage analog delay experience without the headaches, Two Timer is a great choice. Order now and experience true analog delay.